Those juicy bones, red oil, buttery and tender treat; the flavour of myriad spices only brought us to the conclusion that someone said Rogan Josh. Yes! Already smacking your lips? Wait, here’s much more. Among the different kinds of meat dishes across India, mutton preparations have always garnered a bigger fan following. The red meat when cooked carefully results in a dish that is hard to resist. No wonder Rogan Josh is regarded as a prime delicacy, and reserved for special occasions, festivals and get-togethers. Don’t worry, you now need not worry about its preparation because we bring you some easy yet mouth-watering recipe of Rogan Josh. And cherry on the top are the Big Basket Offers which makes it even more interesting. Still waiting to fill that big belly? How To Make That Lip-Smacking Rogan Josh? 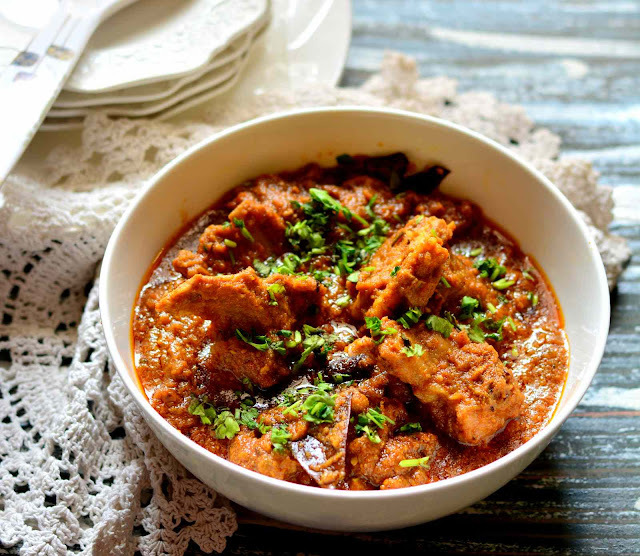 One of the most loved dishes of Kashmiri cuisine, Rogan Josh is loved by the entire country now. The meat is braised in a gravy made of caramelised onions, yoghurt, ginger, garlic and a handful of spices like bay leaves, cardamom, cinnamon and dried red Kashmiri chillies. It is said to draw its origin from Persian cuisine, and the Mughals are credited to have introduced the dish in Kashmir. The Kashmiri chillies lend the dish its rich colour without adding too much heat, unlike other chillies found across the sub-continent. Go through the segregated steps of making Rogan Josh, calm yourself and later relish it with your loved ones. 1. First of all, Rub the mutton with lemon juice and a little salt and leave on for 10 minutes. Then add 2 tbsp curd and marinate overnight in the fridge or at least for an hour. Boil the meat in the water; remove the scum with a ladle until the water is clear. 2. Then, Heat the oil in a thick bottom cooking pot/pan. Be careful not to burn it and just allow to turn its fragrance. Add the salt and the garlic. Boil until the meat is half done. 3. After that, Remove from heat and take out the pieces of the meat. Wash them in a pan of cold water. Keep the meat aside. Then strain the water through a fine sieve and collect it in another pan. 1. Now, Return the pan to the heat and bring the water to a boil and add the meat. Meanwhile, heat the ghee in a pan; add the cloves, and sauté until they crackle. It will take about 10 -12 minutes, do stir from time to time. 2. Then, Remove from heat and sprinkle a tbsp of water and cover. 3. For that blend of spices, To the boiling water, add the green cardamoms, turmeric powder, clove-flavoured ghee and the onion paste. Boil for another 10 minutes. Simmer, cover cook stirring occasionally until the gravy thickens and the mutton is tender cooked. 4. To prepare it better, Stir in the red chilli water. Reduce heat and cook covered. 5. After that adding the Rogan touch - the cockscomb flower extract, saffron water and black pepper powder. 6. Finally, Mix well and bring rapidly to a boil. ü Do use with bone mutton pieces for an authentic dish. ü Adjust chillies to taste; whole red chillies are quite hot so it get a decently hot Rogan Josh at the end. ü You may use the oil of your choice but traditionally Mustard oil is used for its pungent flavour intensifies the recipe. Note: Traditional Kashmiri Rogan Josh has thin gravy and a thick layer of oil on top. This dish is best enjoyed with steaming hot boiled rice. Quality of meat plays an important role in this dish. Select meat with a lot of fat. So, pamper your loved ones by portraying your homemade delicacies made with easy recipes. Here was a quick recipe for the tastiest Rogan Josh, which will definitely calm your cravings. Don’t just sit back, create mouth-watering favourites for yourself and your loved ones. Bring Kashmir to your own city by blending in your skills in the kitchen!